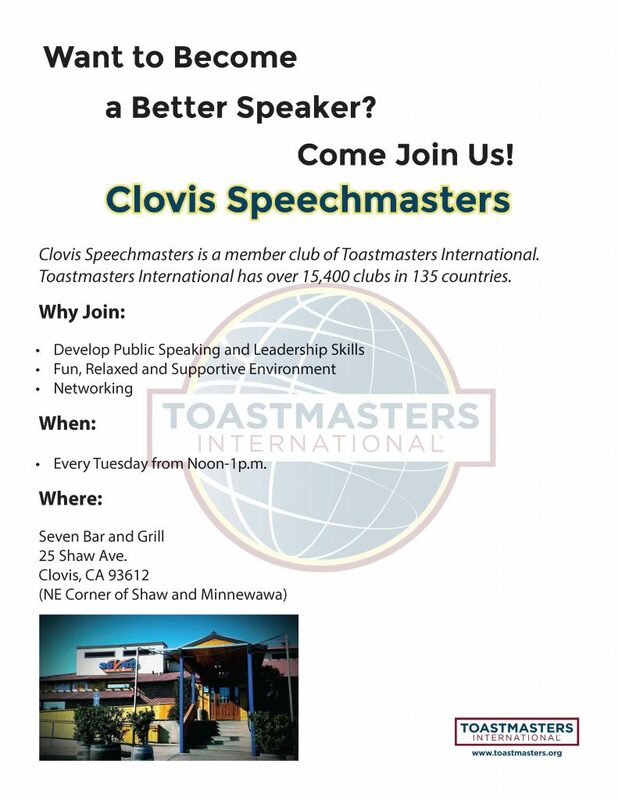 I began the “Let’s Talk Clovis” presentations in September of 2001. On Oct. 9 of that year, the following WWII veterans shared their war experiences: B/General George Middleton, USAF/ANG (retired), Colonel George W. Kastner USAF (retired) and Colonel Jack Weyant USAF (retired). All three were graduates of Clovis High School and Clovis civic leaders. 2004: We began searching for the names of our Gold Star heroes. WWII Naval veteran Ike Herrera, who survived nine major battles, and the Clovis Veteran Memorial District funded the renovation of the Clovis Museum veteran room. 2005: We began reading the names of our heroes each November. We shared the histories of the Clovis American Legion Cecil Cox, Post 147 (organized in 1919) and the Clovis Veterans of Foreign Wars, Post 3225 (chartered 1935). We have selected heroes from each war to document their supreme sacrifice while protecting our freedom. WWI, 1917-1918: 10 Gold Star heroes. 22 students graduated from Clovis High in 1917. John Cecil Cox, 21, was the first Clovis hero to die in action in France on June 7, 1918. The Clovis American Legion Cecil Cox, Post 147 was named in his honor. His father, professor John M. Cox, taught at Clovis High. 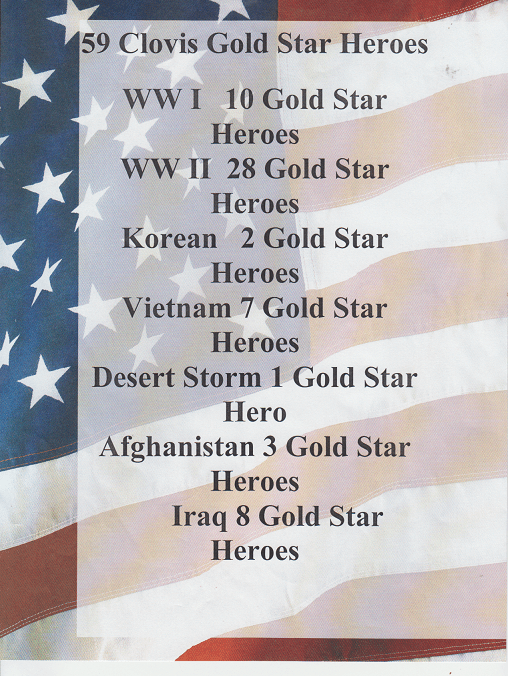 WWII, 1941-1946: 28 Gold Star heroes. Army Technician 4th Grade Malcolm Day was our first hero to die in a Japanese prison camp after being captured in the Philippines. Capt. Dorsey Thomas, the pilot of a B-29 super bomber, was killed in action in China on Dec. 31, 1944. He was survived by his wife and two-month-old daughter. Korean War, 1947-1955: Two Gold Star Heroes. Marine Cpl. Richard Caster, 19, was mortally wounded on June 6, 1951. He is buried in Korea. His father George Caster taught shop at Clovis High. Army PFC Antonio Lopez, 18, was killed in action on Oct. 17, 1951. Vietnam War, 1965-1975: Seven Gold Star Heroes. Army Specialist 4 Danny Dye, 23, was killed in action on his last scheduled combat patrol. Army Sgt. Melvin Kirk, 21, was killed during his second tour of duty in April of 1968. He had been awarded two Purple Hearts and one Silver Star prior to his death. Desert Storm, 1996: One Gold Star Hero. Capt. Leland Tim Haun (Rescue HC-130 Navigator, age 33) was killed on June 25, 1996 during a terrorist attack on the Khobar Towers billet in eastern Saudi Arabia. His father Lee (now deceased) and his mother Carol present a flag in his honor each November. Afghanistan, 2001 and continues: Three Gold Star Heroes. The war was known as Operation Enduring Freedom from 2001 to 2014. The name was changed in 2015 to Operation Freedom’s Sentinel. Army Staff Sgt. Brian Piercy was one month from completing his Army service when he was killed by an improvised explosive device while on foot patrol. Iraq War, 2003 and continues: Eight Gold Star Heroes. Marine Cpl. Jeremiah Baro and Marine Lance Cpl. Jared Hubbard (2001 Buchanan High graduates) were part of an eight-man sniper team on Sept. 4, 2004. They were killed by an improvised explosive device. Jared’s two brothers, Jason and Nathan Hubbard, enlisted in the Army after Jared’s death. Nathan was killed in a Blackhawk crash on Aug. 22, 2007. We remember these words: We are free because of the brave. Freedom isn’t free. All gave some. Some gave all.